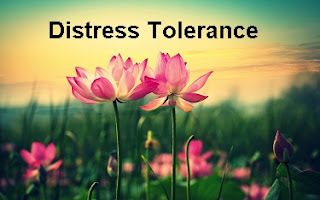 Distress Tolerance means the coping skills necessary to tolerate unsolved problems, without making them worse. "There are two main rules of crisis survival. The first rule is, if you are in a crisis and you can solve the problem now, solve it. Ok. Rule 1: Solve the problem if you can solve it. Alright. The second rule of crisis survival is if you can't solve the problem, survive it. Got that? What are they? The first rule: solve it. The second rule: survive it. "